At the end of the day, the value of a law practice is based on a lawyer's success and the many people that success has touched over the years. This is a significant legacy that contributes to organizational goodwill on retiring from the practice. 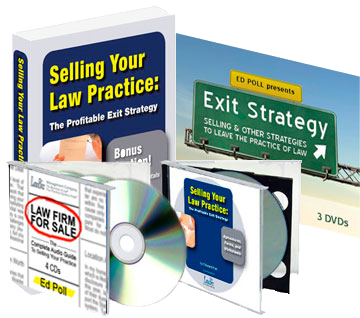 It involves a lawyer's reputation, practice management system and way of doing business â€” all the intangible elements that made the practice successful and provides the selling lawyer with what is most valuable to sell. The better a lawyer's reputation, the more value the law practice will have. A firm with positive, provable goodwill shows that a lawyer has been focused and passionate about the practice of law, and effective at client service. By contrast, firms with bad publicity, a declining client base, or malpractice and disciplinary matters have little goodwill. By the same token, the lawyer who has done the right things with practice technology â€” kept hardware and software up to date, invested in training to ensure staff uses technology effectively, maintained strong functional capabilities through knowledge management and client relationship management databases â€” should be sure to communicate those facts up front. Their value may not be easily quantifiable, but they definitely support the firm's goodwill. The decision to sell a practice is no time to be modest, or to assume that the firm's virtues are self-evident. Of course, goodwill issues are just one illustration that a business is worth only what someone is willing to pay for it, and time is an important consideration. The value may be different at different points in time â€” and valuation and price may not be the same thing. But, in the context of buying a business, even a law practice, one must look at the future. 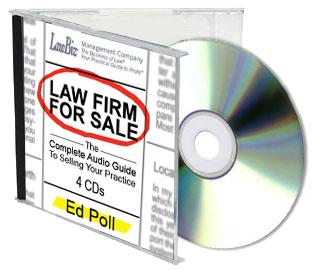 When valuing a law practice, one should also look to the expected future earnings of the practice. Many people believe that the price to be paid must be based only on this figure generated by the existing practice, but there can also be an inclusion of future earnings that may be based on the buyer's talents brought to bear on the purchased practice in some cases.